When my little niece turned two, I wanted to knit her something unique to match her intelligent personality. 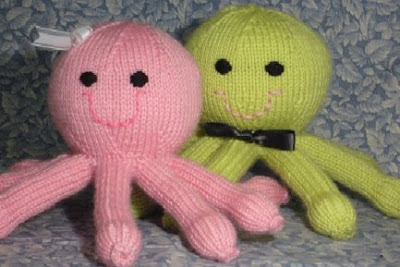 This simplified octopus is the result of playing with yarn and ideas for a few weeks. Kallie Mairi is suitable for children under three or as old as you like. notions required: darning needle, stitch holders, waste yarn, poly stuffing, ribbon. Kallie Mairi is knit in stockinette on considerably smaller needles than suggested for Swish Superwash Worsted. This gives her a bit more structure and prevents the poly stuffing from poking through the knitted fabric. Each tentacle is a separate knitted tube. These are grafted together to form a ring of tentacles. The live stitches from the inside and outside of this ring are then worked separately in the round. A worsted weight cotton yarn would also be a suitable choice for Kallie Mairi.